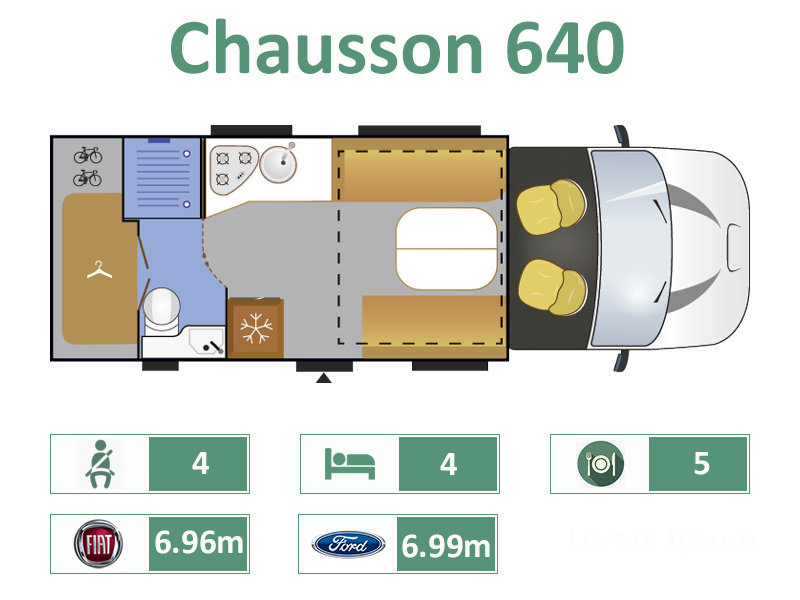 The Chausson 640 model builds on the success of it`s sister vehicle the 630, offering similar sensible space management techniques including the Smart Lounge, and jump-seats beneath, and bed making feature. The 640 however offers a massive electric drop-down double bed situated over the lounge across the vehicle in this case, which enables the kitchen area to be more spacious than the 630, and has additional cupboard storage and work top space as well. As with the 630 model the 640 has a full width rear wash-room, wardobe and large garage beneath. Available in the Welcome or Welcome Premium specifications, and on the Fiat or Ford chassis with manual or automatic transmissions, or in the Titanium specification on the Ford chassis with Automatic as standard.